In 2016, Auburn University and the Peace Corps established a partnership that brought the first dedicated campus recruiter for the international development program to the state of Alabama. This fall, Nick Parr assumes the role as Auburn’s second Peace Corps campus recruiter. Parr initially thought about applying for the Peace Corps right after completing his bachelor’s degree in 2009. However, it was not until he earned his master’s degree in 2011 that he decided to apply with the organization. 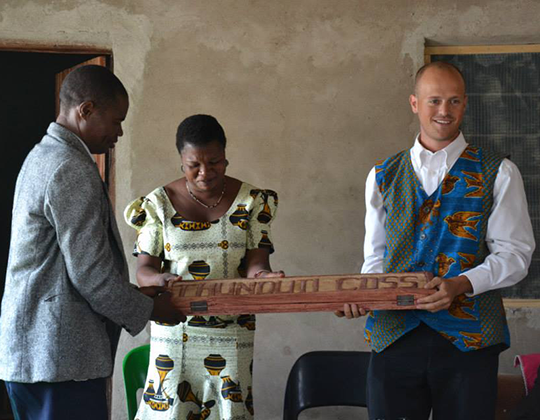 In 2012, after a few months of in-country training, Parr swore in as a Peace Corps volunteer in Malawi and was assigned to teach science in a rural secondary school. During his second year, he devoted most of his time to serving as a teacher development facilitator and an adjunct faculty member at Livingstonia University. As the new Auburn University Peace Corps Recruiter, Parr hopes to continue the innovative projects started by the previous campus recruiter, while also reaching out to even more people around Auburn’s campus and within the Auburn community that may not have heard of or considered joining the Peace Corps. “I would have never joined the Peace Corps if not for the efforts of my campus recruiter, and I’d like to pay that forward,” said Parr. Parr assumes the role from Amanda Denney who over the past two years, while obtaining her master’s degree in English, worked as Auburn’s first Peace Corps campus recruiter. Prior to serving in this role, Denney volunteered with the Peace Corps in Burkina Faso for two years. In addition to fulfilling her responsibilities as a non-formal girls education volunteer, Denney also taught English as a Second Language, served on the Community Health and AIDS Taskforce and Peer Support and Diversity Network, helped organize and facilitate two youth camps and led several health awareness projects. While serving as Auburn’s campus recruiter, Denney successfully cultivated and sustained a Peace Corps presence on campus. Her notable efforts consisted of establishing an effective campus ambassador program, which allows students interested in Peace Corps to gain an in-depth understanding of the organization, as well as receive assistance with the application process and a letter of recommendation from the campus recruiter. Additionally, this past March, Denney worked with Peace Corps and Growth International Volunteer Excursions to provide Auburn students with an alternative spring break experience in Nicaragua. The students spent the week encountering different aspects of Nicaragua through grassroots work with rural communities while meeting with Peace Corps volunteers and experiencing Nicaraguan culture and history. In May, Denney graduated with her master’s degree and finished out her term as campus recruiter directly following in June. The Office of International Programs is grateful for her efforts, which have solidified a solid foundation for Parr to build on. Students interested in the Peace Corps can visit Parr during his open office hours, Tuesdays 9-11 a.m. and Thursdays 1-3 p.m. in Foy Hall 235A. To schedule an appointment outside of these times or to request information, please email peaceco@auburn.edu or call 334-844-8291. For more information on Peace Corps opportunities with Auburn University, visit the Office of International Programs website.